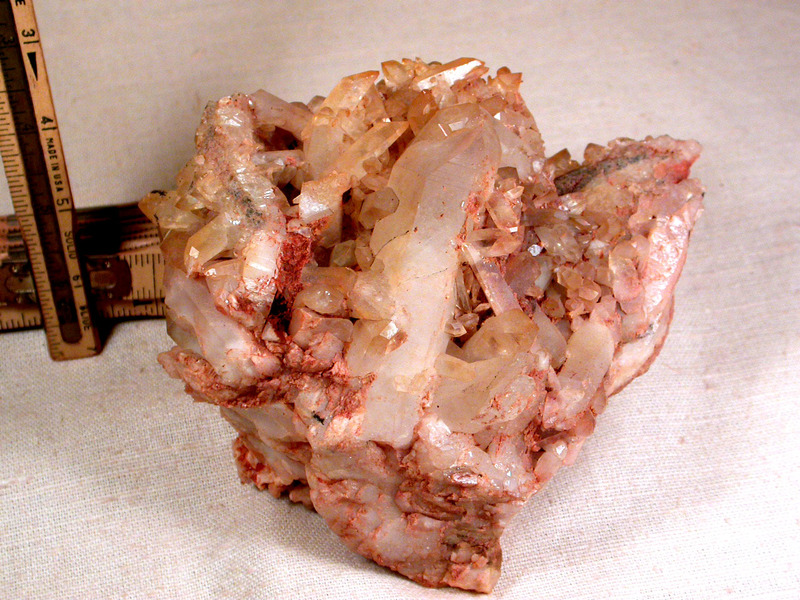 Mine 'fresh', this 4-1/2x 6-3/4x 6" tall clear and milk quartz cluster is leaving clay all over the place. Partially has that great golden healer look without being one. Natural iridescence plus rainbows. Largest crystal is a penetrated channel and 1-1/8x 3-1/4". 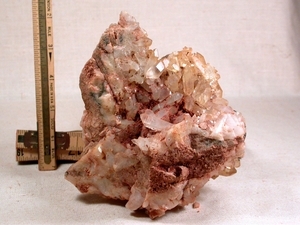 There are at least FOUR crystals with an uncommon 7h face; penetrated crystals; doubly-terminated crystals; crystals with black external graphics [petroleum? ]; and thin sandstone matrix. Suitable as a garden cluster, if protected from extreme temperatures and direct sun. Equally happy on a washable mat indoors. The look of super motion with a deep 'V' back.